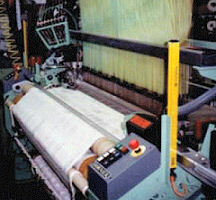 The CARY System utilizes the vacuum and exhaust air of a 1 HP regenerative blower to concentrate vacuum and exhaust air to specific areas of the loom that cause problems when lint and fly accumulate. Eltex Guide Blow-Off Nozzle to prevent buildup of lint in the eyelets. 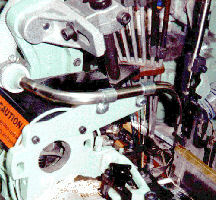 Selector Finger Suction Nozzle collects fly generated by fill yarn passing through finger guides. Rapier Opening Area Blow-Off Nozzle blows air into this area and helps prevent rapier problems, as well as migration of fly to the fabric. Right Hand Side Tail Suction Nozzle removes lint, but also controls tails with suction tension and prevents loop-backs of the tail.